Dennis Scarborough entered the U.S. Air Force Academy in June 1986, and was commissioned a 2d Lt in the U.S. Air Force on May 30, 1990. Lt Scarborough attended the Euro-NATO Joint Jet Pilot Training program at Sheppard AFB, Texas, and was awarded his pilot wings in October 1991. His first assignment was as a Sortie Support Flight Commander and Assistant Maintenance Officer with the 336th Fighter Squadron of the 4th Fighter Wing at Seymour Johnson AFB, North Carolina, from October 1991 to November 1994, followed by F-15 Eagle training at Tyndall AFB, Florida, from November 1994 to May 1995. Captain Scarborough next served as Assistant Weapons Officer, as an Electronic Combat Pilot, and as Squadron Plans and Mobility Officer for the 27th Fighter Squadron of the 1st Fighter Wing at Langley AFB, Virginia, from May 1995 to April 1998. His next assignment was as Assistant Director of Operations, as a Flight Commander, Academic Instructor, and as Assistant Chief of Programming with the 95th Fighter Squadron and the 325th Operation Support Squadron, both with the 325th Fighter Wing at Tyndall AFB from April 1998 to April 2001. Major Scarborough served as Contingency Plans Officer with Combined Forces Command at Yongsan, South Korea, from April 2001 to May 2003, followed by U.S. Army Command and General Staff College at Fort Leavenworth, Kansas, from May 2003 to June 2004. 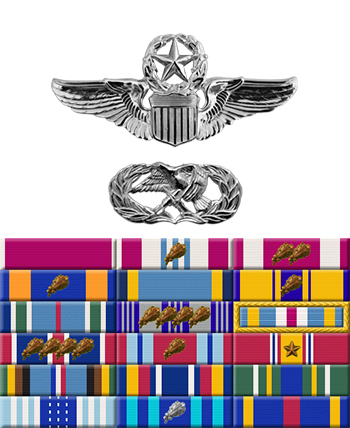 His next assignment was as Assistant Director of Operations and Chief of Training with the 60th Fighter Squadron of the 33rd Fighter Wing at Eglin AFB, Florida, from June 2004 to June 2006, and then as Director of Operations with the 58th Fighter Squadron of the 33rd Fighter Wing at Eglin from June 2006 to March 2007. 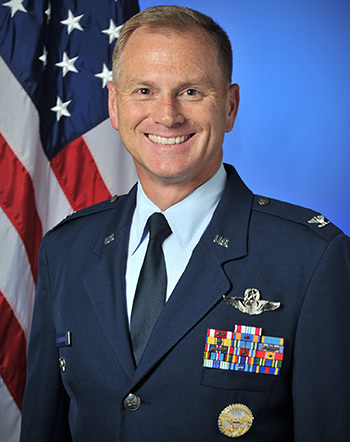 Colonel Scarborough served as Chief of Safety for the 33rd Fighter Wing at Eglin from March 2007 to May 2008, followed by service as Commander of the 33rd Operations Support Squadron at Eglin AFB from May 2008 to July 2009. His next assignment was as Deputy Commander of the 1st Operations Group at Langley AFB from July 2009 to July 2010, followed by Joint Advanced Warfighting School with the National Defense University at Norfolk, Virginia, from July 2010 to July 2011. He served as Country Director in the Office of the Secretary of Defense for Policy in the Pentagon from July 2011 to July 2014, and he is currently serving as Vice Commander of the 81st Training Wing at Keesler AFB, Mississippi. Colonel Scarborough is a Command Pilot and has amassed over 2,400 flying hours in the F-15 Eagle, T-38 Talon, and T-37 Tweet, with 187 combat flying hours in the F-15. He earned his Bachelor of Science Degree in Humanities from the U.S. Air Force Academy in 1990, and his Master's Degree in Aeronautical Science from Embry-Riddle Aeronautical University in Daytona Beach, Florida, in 2004.